After a few days wandering around Maputo (and visiting Ministries as part of my work assignement there), I flew to Nampula, the main city in the north of the country and a busy commercial centre where I spent just a day. 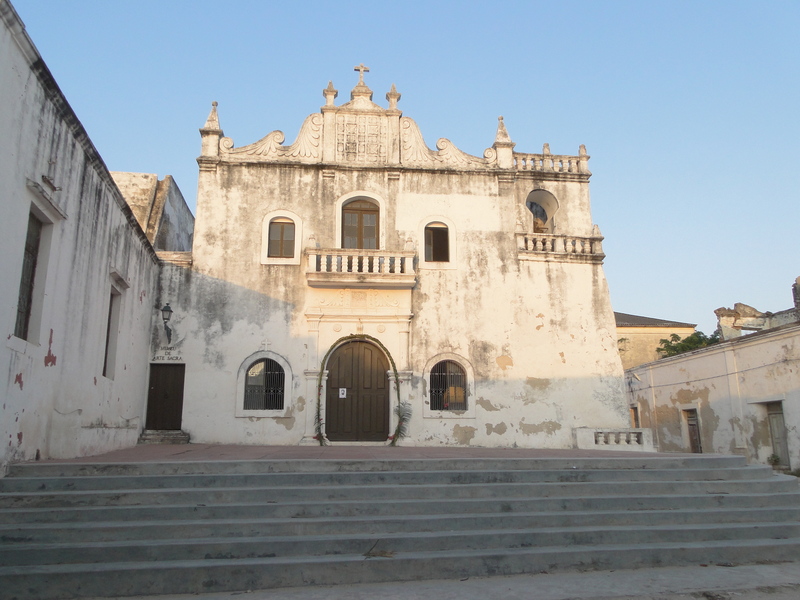 Nampula is a pleasant enough city with a big colonial church as its main cultural landmark and plenty of banks and shops. It reminded me of a Mexican road town in the 1990s, with parallel and perpendicular streets full of industrial supply stores. From there, I travelled through the provinces of Nampula and Zambezia, spending on average six hours a day in a car to document development projects financed by the UN and the Mozambican government. Rural Mozambique feels more developed than Ethiopia mainly because of the presence of large trading firms dealing in export agricultural commodities and many 4×4 pickup vans, however, small farmers are just as poor and illiterate. The project I visited is trying to put in place commodity value chains to help farmers move into commercial production as opposed to subsistence agriculture, and in that respect, it is facing many challenges I will not describe here. 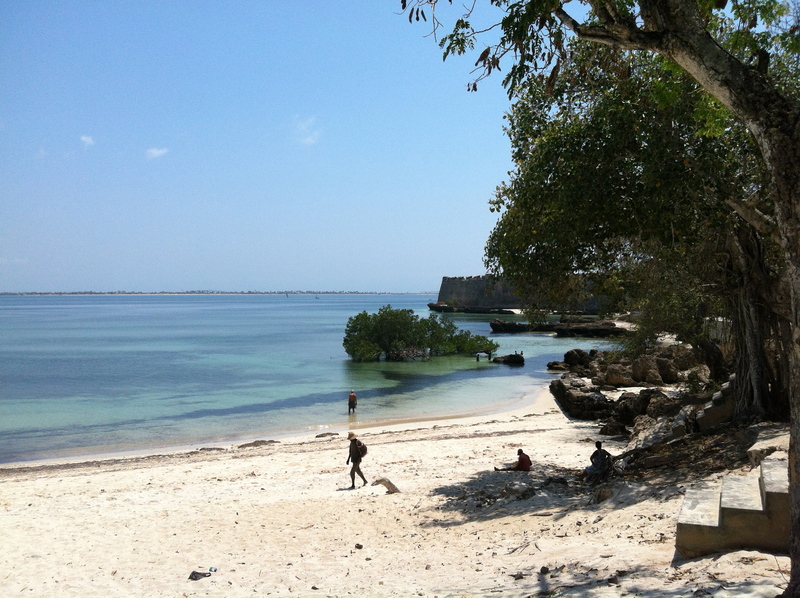 I prefer to concentrate on my weekend escape to Ilha de Mozambique, the former Portuguese capital of the country and a tiny island (now connected to the mainland by a 4 km bridge) about three hours drive from Nampula. When I read about the existence of Ilha de Mozambique prior to my trip and realised that I would be relatively close to it, it became my priority not to say my obsession to go there. Strangely, the wind was blowing in my direction and everything concurred to my going there. My return flight was a day later than my colleagues’, the hotels in Nampula were all booked up on the Saturday night so my best option turned out to go to Ilha for the weekend. 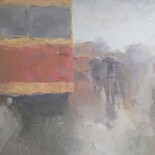 I couldn’t have wished for a better set of circumstances, so I set off and never regretted it. Ilha de Mozambique is one of those magical places where the emotional impact on arrival is very strong. I am thinking of my friend Mike W here as I’m sure he would love the place. As I entered Stone Town, the old Portuguese town made of brick houses (as opposed to the mud and straw Makuti Town adjacent to it), I was stunned by a majestic old palace, overlooking the wide and open Indian Ocean. The still imposing building was decrepit and left almost abandoned. I thought it might have been the old Governor’s palace because of its location in the very centre of the town. 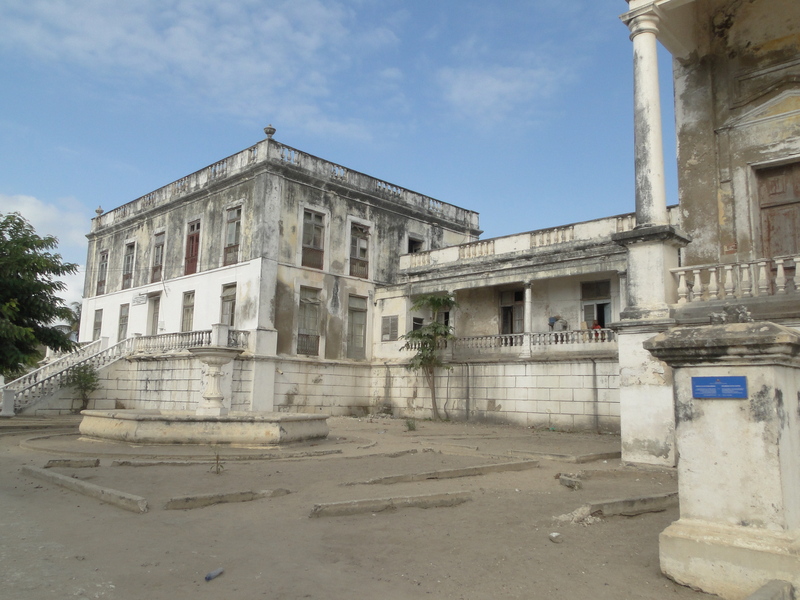 I learned the next day that it was a hospital, the first ever built in Mozambique in the 19th century and the largest in sub-Sahara Africa in its time. What was ever more amazing was the fact that it is still a hospital, although the main building is no longer in use. I wandered around the grounds and found the hospital rooms at the back in some modest annex, where people were being treated in the most rudimentary conditions. Some local people I met told me that there are plans to close it and transform it into an upmarket hotel; their main worry was the potential lack of medical treatment on the island if the hospital, even in its current state, came to close down. Luckily, the rest of Stone Town was more uplifting. I stayed in a beautiful colonial-style guest house (Casa Escondidinha) run by a Mozambican-French family, with large attractive bedrooms and a swimming pool sheltered in the middle of the internal courtyard; the kind of place where guests immediately feel at home. I spent my days wandering around Stone Town, not knowing whether I was in Sicily or Mozambique, with the run-down European houses, the churches, the arcaded shopping streets, the piazza and the empty roads basked in strong midday sunlight. I also visited the impressive 16th century Fort built by the Portuguese to defend their stronghold (which they successfully managed to do against the Dutch). The so-called San Sebastiao Fort, located at one tip of the Island, was the heartbeat of the Island at some point in history. If restored, it could be an amazing contemporary art space, although I liked its feel of a semi-abandoned place inhabited by the ghosts of the past. A few miles away offshore, a Portuguese ship, the Espardate, carrying treasures from Macau famously sank in1558. It was rediscovered in 2001 by a group of underwater explorers who managed to rescue some of its shipment. It included a highly refined collection of 16th century Chinese Ming porcelain (1,500 pieces) which is now exhibited in the Island’s museum. With the broken bits which couldn’t be glued back together, local artists started creating original silver and china jewellery pieces which have since become well known in the country. In the last decade, Ilha has become a bohemian centre attracting an international crowd of artists who have moved there to restore old houses and enjoy its unique history and location. I also came across a family of American missionaries who decided to move to Ilha and teach their children through home schooling (they didn’t tell me why). In spite of the foreign influx and the high proportion of restaurants and bars catering for visitors, Ilha remains an authentic living place with a primary and secondary school, a mix of churches and mosques, a Town Hall with genuine urban issues affecting the town. I just wish I had more time there to fully absorbe its magic. Thank you for the evocative, colorful introduction to a land I know so little about! 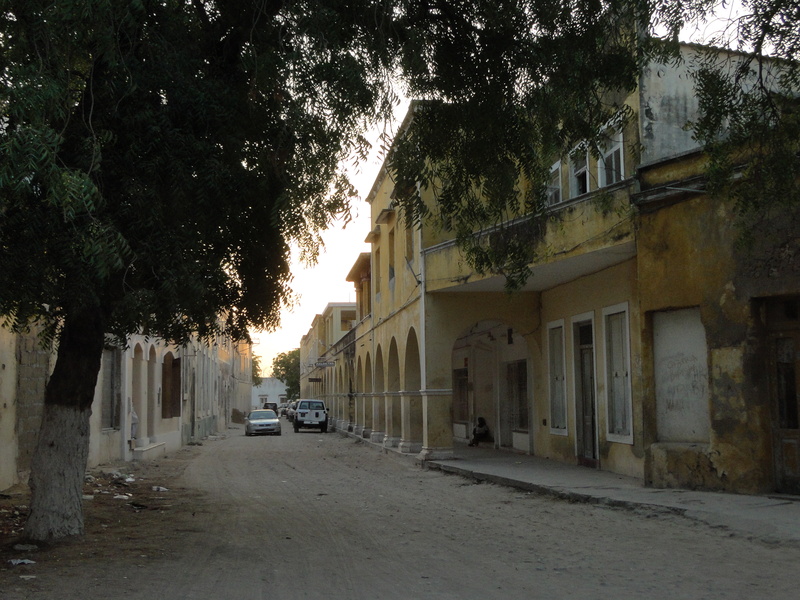 This entry was posted on November 29, 2013 by Salambo in Travelling outside Addis and tagged africa, Chinese Ming porcelain, Espardate, Ilha de Mozambique, mozambique, Nampula, old Portuguese capital, Shipwreck, stone town.